Aug. 2012 I hate to say it, but summer will soon be winding down. This summer so far has certainly been a hot and dry one with record temperatures. The bugs and weeds have had a heyday to say the least. It’s amazing how early everything is this year. Most grains have been harvested and the walnuts are huge and plentiful on the trees near my yard. The squirrels are already lining up to harvest those. The town’s flowerbeds look amazing. Our volunteers have outdone themselves this year. We have been receiving lots of positive feedback about how nice they look. As you know there has been quite a lot of construction going on this summer. There have been massive flowerbeds added to the downtown area near the bridge which we will be planting and looking after. Once the dust settles the downtown core is going to be absolutely beautiful. Trillium Awards are a huge part of what our society is all about. We strive to honour Dunnville’s citizens for their hard work making their homes and gardens beautiful. These outstanding homes are also a reflection on Dunnville as well. We will be presenting the Trillium Awards to the winners at our September 20th general meeting. Please be sure to attend to congratulate the recipients. Many of our present day members first came to a meeting because they won an award and ended up becoming a member, myself being one of them. Our guest speaker for August is Koreen Di Fruiscio who will be talking to us about “Living & Gardening with Arthritis”. Gardening with arthritis is a major challenge, as are most daily tasks when we live day to day with this affliction. Don’t forget the photography contest which will be judged at the November general meeting. There are 4 categories (Spring, Summer, Fall, Winter) and you can enter 1 photograph in each category. Garden tip of the Month: Fall Mums should be arriving at your local garden centre any time so plant now for a colourful autumn. If you choose a hardy mum it should come back next year. They are a little on the tender side so be sure to plant it in a protected area so it can survive winter. This month is also ideal for dividing irises. Irises are one of my favourite perennials. Here’s a thought: when you’re dividing them you can share them with your friends or pot them up for our plant sale in May as they will have no problem surviving the winter that way. See you at the next general meeting. Meeting was officially opened by President Judy Jeffery at 7:25 p.m.
Refreshments were announced. Thank you to Maura Cooper for organizing the tea/coffee and goodies for the evening. 36 members were signed in. Silent Auction: Kim Christoff announced that there were items on display for the evening’s silent auction. Minutes: The minutes from July were distributed to the members to read. There were no errors, omissions, or questions. Vel LeVette moved to have them accepted as read, and Gwen Van Natter seconded. All were in favour. 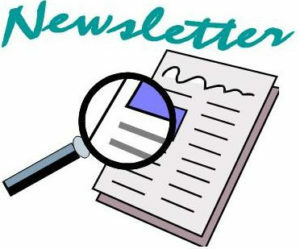 New Mail: Newsletter from GRCA “Grand Actions” for July/ August. Information package from the Canadian Food Inspection Agency regarding the spread and control of Emerald Ash Borer. This information will be added to our website. Flyer from Port Dover/Woodhouse Horticultural Society regarding the OHA Carolinian District 6 Fall Dinner on November 6th. All Society members are welcome. This will also be posted on our website. Treasurer’s Report was ready by Kim Christoff. We recently received a grant from Haldimand County in the amount of $3700.00. This is a grant for the beautification of Dunnville (flowerbeds only). We are paid based on the number of volunteer hours each year. It is very important that everyone keep track, even if you think what you are doing doesn’t amount to much. If you have any questions regarding volunteer hours please see Kim or Lori Maracle. We will be applying for a grant again this fall. Next year we will have increased watering costs and more flowerbeds to look after as the town has added new beds near the bridge. New Business: Shrubs from the old Hydro building flower bed by the bridge are unfortunately dying. We were given very short notice that the bed was going to be torn up and they were moved at the worst possible time what with the heat and humidity. They were moved but with little time to plan they aren’t doing well. Mary Galli has graciously donated several daffodil bulbs which will be planted in the new beds in the fall. We need volunteers to help out. Please let Kim or Lori know if you are interested in pitching in. Judy announced that the Fall Flower & Vegetable Show has been cancelled. 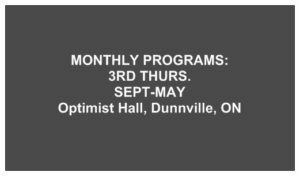 The Optimist Hall will not be available September 22nd. In the past we have used Grandview Lodge, but at this time they are under “lock down” and very difficult to get in and out of, so we regretfully will not be holding the show this year. If anything changes members will be notified by phone and email. Elections will be taking place next month at the general meeting. We are in need of 4-5 new directors. Nominations will be accepted tonight if anyone is interested. Please donate some of your time for next year. We meet once a month at the Chamber of Commerce for an executive meeting. Vice President Lori Maracle is now writing a monthly column in the Dunnville Chronicle. Please take the time to read her articles as they are very timely and informative. Betty called the winning ticket numbers for the Ways & Means draw. $60.00 was raised. Great job as usual Betty! The silent auction was a great success bringing in $311.00. The winners of the Silent Auction were: Don won the painting for $130 and the table for $20. George Vrkljan won the fireplace for $61. Judy won the radio for $45 and Mary Lou won the pond kit for $55. We would like to express a HUGE thank you to Ruffin’s Pet Centre for donating the pond kit, Giant Tiger for donating the coffee table, the radio/cd player, and the fireplace, and Mary Lou Johnston for donating the beautiful hummingbird painting. Meeting was adjourned at 9:00 p.m.